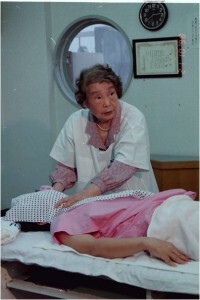 Far Infrared Onnetsu Heat Therapy was first developed by a Japanese acupuncturist, Dr. Mitsui, which she combined on the newest scientific technology of Far Infrared (FIR) and the ancient traditional Japanese concept that our unhealthy cells are cold due to the lack of energy (heat). Medically, people with low body temperature suffer from different symptoms. Dr. Mitsui combined this traditional Japanese healing modality with newly conceived FIR ceramic heat elements and invented a device called “Ensekigaisen Onnetsuki”. It is the only hand–held device. During Far Infrared Onnetsu Heat Therapy, an Onnetsu practitioner searches for those cold parts deep inside of our body by moving Onnetsuki over the body. The Onnetsu practitioner applies the Far Infrared vibration with proper heat until it reaches the bone, and warms up. The patient experiences some areas as “HOT” because the skin there is cold and the sensation manifests as “HOT”. It is important that the FIR energy penetrating into the body until it reaches the bone and this step is the key of a successful Far Infrared Onnetsu Heat Therapy. A trained Onnetsu therapist can get amazing results on all health problems, but everyone can benefit. In the case of cancer, cells are extremely cold and the patient may even feel pain. By applying Onnetsuki onto these areas repeatedly, the FIR energy goes deep inside then giving FIR energy to those normal cells around, making them stronger and healthier to kill the cancer cells. When the heat reaches and warms up the cells, those areas no longer feel hot and healing starts. (2) promotes circulations of blood, hormone, other body fluids, and Qi(life energy) flow. (3) enhances the quality of white cells and raises one’s immune system. (4) As a result, it improves the self healing power and produces metabolism, strengthens one’s vitality for healthier Body & Mind. Since this therapy is based on improving one’s own healing power, it is completely natural and harmless. skin problems, sports Injuries, diabetes, hepatitis, kidney problem, cancer, and other difficult problems.